Mustard seeds are small seeds of three related brassica (yes them of cabbage, turnip and broccoli fame) plants that give black, brown and white/yellow mustard. It is one of the few spices that will grow in the UK. 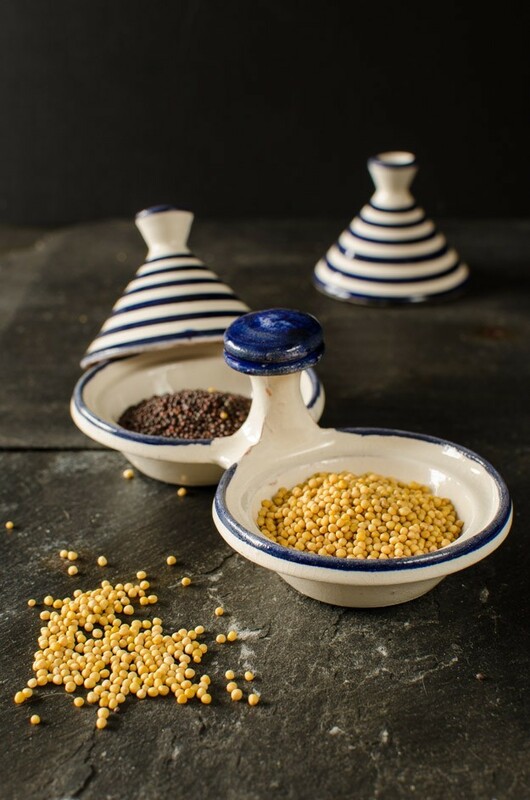 The heat and fire in mustard seeds is only released once the seeds are broken down and this usually means grinding them and adding moisture. The heat molecules (icothiocyantes) are short lived unless something acidic (like vinegar) is added to the mix and are heat inactivated so once roasted like other spices often are, they remain with just a vague sense of mustardiness is left. Mustard seeds are a common ingredient in Indian cuisine and others of the region, especially in pickles, chutneys and vegetable dishes. Mustard oil, extracted from the seeds, is also often used. 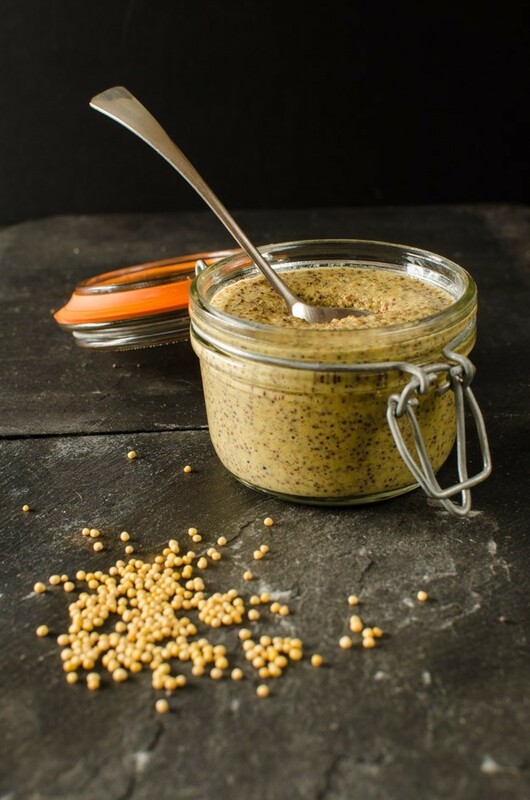 But perhaps the biggest use for mustard seeds in the cuisine of Western countries is as made into the condiment mustard in all its multitudinous varieties, for serving with cold meats, roast beef, and adding to mayonnaise, vinaigrettes, marinades and sauces. In its dry form, powdered mustard lacks potency; the addition of water releases the pungent compounds. The pungency of mustard is always reduced by heating; if added to a dish during cooking, it gives less pungency than if added afterwards. The many varieties of prepared mustards have a wide range of strengths and flavors, depending on the variety of mustard seed and the preparation method. The taste and “heat” of the mustard is determined largely by seed type, preparation and ingredients.Preparations from the white mustard plant have a less pungent flavor than preparations of black mustard. The temperature of the water and concentration of acids such as vinegar also determine the strength of a prepared mustard; hotter liquids and stronger acids denature the enzymes that make the strength-producing compounds. Thus, “hot” mustard is made with cold water, whereas using hot water produces a milder condiment, all else being equal. Mustard seeds can easily be bought in bulk from Asian/Indian grocery shops. The advantage of making mustard condiment yourself, is that is infinitely customisable and you know exactly what has gone into it. You could use a local beer or mustard for a local feel or herbs from your garden (tarragon is traditional). You could alter the heat by increasing the proportion of black seeds or even adding a chili. This mustard will keep for at least a month in the fridge. Mix the mustard seeds and beer in a glass bowl, cover and leave overnight or 24 hours. Sterilise small jars for the mustard – clean well and set in an over set at about 120 ºC for 15 minutes or so, leave to cool in the oven. Tip all the ingredients (including the soaked mustard seeds and any excess beer) into a food processor and process until thick. You will need to scrape down the sides a couple of times. Stop when the mustard has achieved the desired consistency – I like mine more whole grain. Leave the mustard to sit for 15 minutes at least before tasting and adding more honey etc as you think it needs it. Spoon the mustard into the cooled jars, tapping gently on a a wooden board to release trapped air bubbles. Seal tightly and store in the fridge.